Founded in 1929, with Amelia Earhart as one of the founding members, The Ninety-Nines is one of the worlds oldest and largest organization of women pilots. 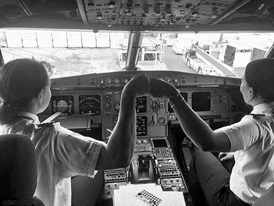 With over 6,500 members throughout the world, our mission is promote world fellowship through flight, provide networking and scholarship opportunities for aviation education in the community, and preserve the unique history of women in aviation. The Greater Seattle Chapter of The Ninety-Nines provides camaraderie, networking opportunities, activities, and educational opportunities for women pilots. Our chapter is a diverse group of women pilots including newly minted private pilots, sport pilots, private pilots (current and non current), student pilots, and commercial pilots. Our commercial pilots fly as corporate pilots for the airlines and as test pilots. We fly a variety of aircraft, from helicopters to jets, from float planes to all makes of single and multi- engine land planes and even hot air balloons. Several of our members have been with The Ninety-Nines for more than 30 years and some have just joined us. All are welcome. Our meetings are on the third Wednesday of every month at Embry Riddle Aeronautical University 1000 Oakesdale Avenue SW #110 Renton, WA from 6pm to 8pm. Find out about our organization, mission, and what we do to help promote women in aviation. Providing scholarships to women who are looking to further their desire to become pilots is a large part of our mission.